The Riviera Nayarit was invited to the Festival to expand on the topic “Top Birding Destinations in Central and North America: Mexico’s Riviera Nayarit,” thanks to the shows James Currie taped in this destination. The 18th San Diego Bird Festival will take place from February 27 – March 2, 2014 and the Riviera Nayarit will play an important part in the event thanks to its reputation as one of the most important birding destinations on the continent. 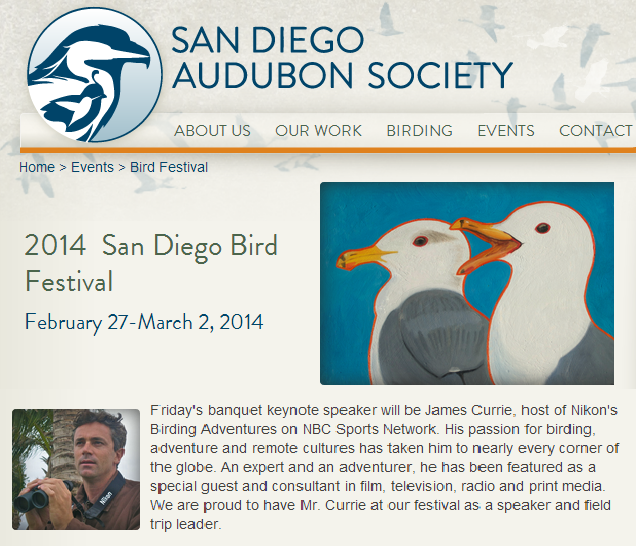 Currie is the creator, host and producer for the birding show, Nikon Birding Adventures TV. James created two shows in the Riviera Nayarit in 2013, one of them on Isabel Island, which subsequently aired on the Discovery Channel twice at the start of this year. Currie is known for his professionalism in his birding life, having organized excursions for over 12 years, while photographing and recording images from the Amazon to Australia, Africa and Madagascar, just to name a few. James will also be the keynote speaker for this edition of the Festival. The Riviera Nayarit Convention and Visitors Bureau truly made a wise decision when it made the arrangements for James Currie’s visit to the destination, as the results continue to generate excellent exposure. The San Diego Audubon Society is dedicated to the protection and appreciation of birds, other wildlife and their habitats through education and research, focusing on environmental restoration and conservation. This particular chapter dates back to 1948 and since then they have created two wildlife sanctuaries in San Diego; their goal is to have three thousand volunteer hours dedicated to the birds. Much like San Blas, San Diego is an area where there is a huge concentration of birds, both endemic and migratory, with more than 500 species. Both regions are actually migratory corridors for birds of the Americas. The nature programs focusing on the Riviera Nayarit have elicited a lot of interest. This Festival is a wonderful showcase to entice visitors interested in birding, especially important considering that in the United States alone there are 15 million confirmed birdwatchers.